I have a passion for helping people be the best they can be and have had an amazing time training as an instructor. I opened First Step 2 Fitness in September 2003 the ladies only club, If your looking for weight loss, muscle tone, general health, exercise is great for improving depression and keeping the mind and body young. I am proud of my vast training having passed several courses over the years. Some I have loved, others not so much however I believe you learn something valuable on every training course. I am proud of all my team they are all quality trained instructors teaching to the best of their abilities and aim to offer fun, hard, result driven classes every time. I am qualified in Pilates, Step, Aerobics, GP referral qualified, nutrition qualified, Power stretch , Fit ball, Kangoo Jumps, Boxercise, Cardio Kick box, advanced free weights, body bar, Zumba, Zumba Toning, Zumba Gold, Zumba kids, Kettfusion, Kettle bells, Block fit, Powerhoop, Box hit,Kpopx Fitness, Urban Dance Fitness I am also a proud Herbalife level 10 winning coach and I coach and mentor people . I have my own specialist classes including Glow fitness, Bounce Rocking Abs Bounce and Spooning. I have over 20 years in the fitness industry and I am still learning every day I aim to bring you the best classes first, my motto is if its not fun they wont come. Pauline is the most senior member of the team. She has a wealth of experience and is the rock of the business. Nothing is ever too much trouble and she’ll help anyone. Pauline is fully trained in advanced free weight body bar and an amazing fit ball specialist, always a smile and a warm welcome will await you. Fay is a true asset to the team and has recently qualified as a Kpopx Fitness Instructor She is Qualified to teach Powerhoop, Spin, step, total toning, body bar, block fit, kettle bells And what we are famous for at first step 2 fitness the amazing ever popular Zumba . Fay is also Herbalife body challenges and she teaches a variety of classes after passing her exercise to music course. She is enthusiastic, a true believer in hard work, gets results. Nothing is too much trouble and she will help you achieve results in the fastest time. We are so lucky to have Heather return to the gym. 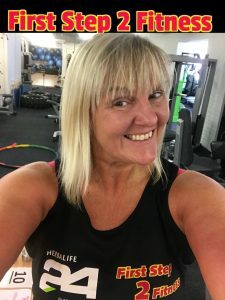 She was the first Zumba instructor in Teesside (Sue and Heather trained as Zumba instructors in 2003 together) and she’s a highly experienced, highly qualified instructor. Heather is our smiley Saturday girl she teaches Pilates at 10.30. she is a lecturer at college and runs a thriving fitness business in Middlesbrough. Mandy loves to dance and she’s been dancing since the age of 5 in local community classes. Mandy is fun, smiley and encouraging in all her classes. She is qualified as a UKA Cheerleading teacher which she runs outside the gym. Mandy is a great sosa dance instructor, a true ambassador of the motto ‘dance yourself happy’. Mandy recently trained as a powerhoop instructor, this class has everything, strength, cardio and is the ultimate waist trimmer class. Her new passion is Kpopx Fitness, The new Korean Pop Music Workout. You will love this fun, catchy, creative class, high energy great choreography. Mandy excels at teaching children of all ages, she loves seeing them learn and her encouragement and smiley personality shine in the new kpopx kids fitness class. In her free time she is learning Latin and Ballroom dancing and is certified NCDTA Silver second bar in ballroom and in Latin up to gold, this is a progressive learning which is Mandy’s hobby. Alisha is the youngest member of the team. She has been a dancer all her life and joined the gym at 14. Since then she has trained as a kpopx fitness instructor, She team taught along side sue gaining her confidence and now she takes The class on her own every Sunday at 20.30 we are all very proud of her. She is full of enthusiasm energy and confidence. Alisha is only 15 and still at school she has stared in many dance performances and is going to be doing fitness full time at college in 2019. We all no that Alsiha will go far in this industry. Laura is the newest member of the team. She is qualified as a gym instructor and you will see her lovely smile every Monday morning. Laura joined us over 10 years ago and has lost over 4 stone following our advice showing what we do really works. She is chatty helpful and an asset to the gym.